Since 2002, over 14,500 deer in Virginia have been tested for Chronic Wasting Disease (CWD). 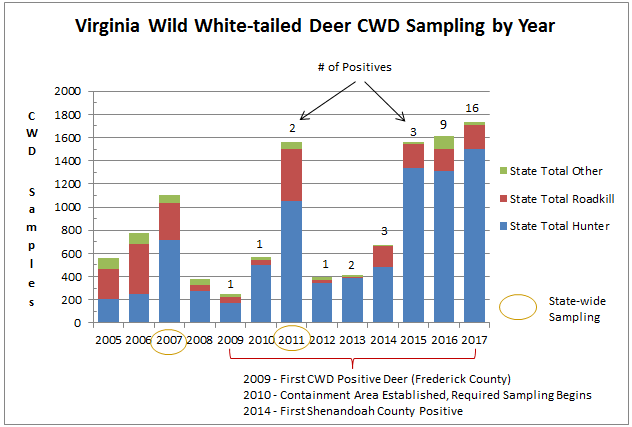 As of April 2019, the Department has diagnosed 68 positive cases of CWD in Virginia since 2009. As of April 2019, three CWD-positive deer displayed clinical signs of CWD prior to death. These signs included severe emaciation, confusion, lack of fear of humans, and disorientation. Deer infected with CWD can take 18 – 24 months to get sick and exhibit symptoms but may spread the disease to healthy deer even when they do not appear sick. Below is a summary of CWD Surveillance efforts in Virginia since 2005. The map below shows the location of Virginia’s CWD-positive deer from 2009 to 2018. 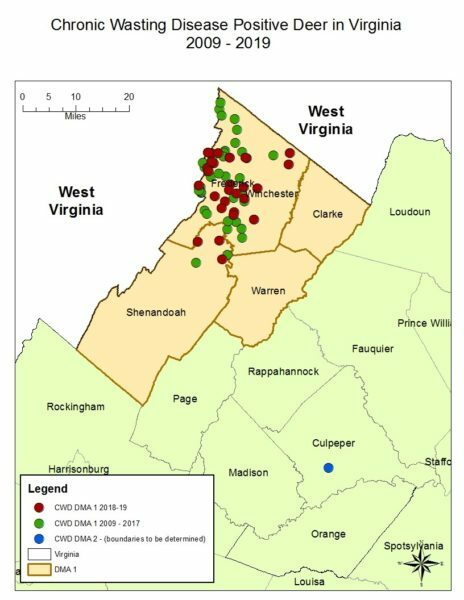 During the first few years of Virginia’s CWD outbreak, infected deer were found in a small cluster located very close to the West Virginia state line. 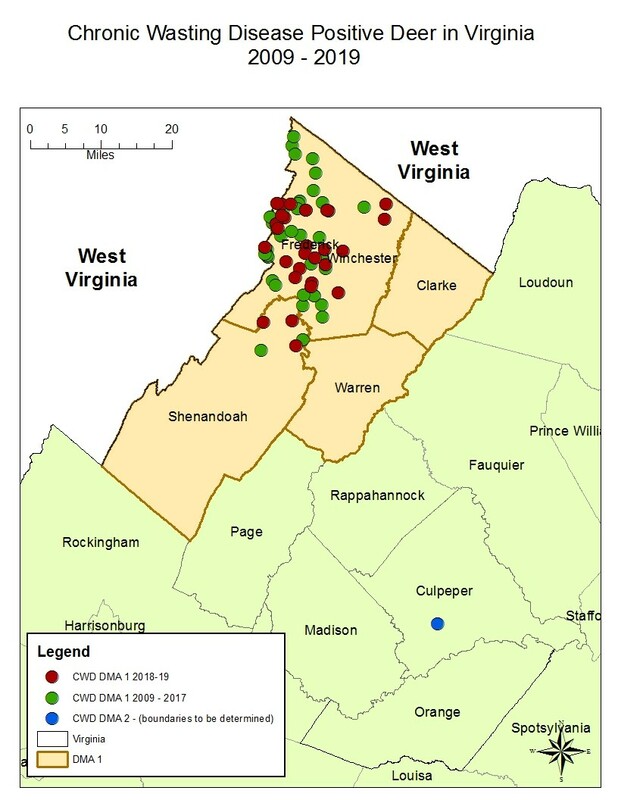 Beginning in 2013, CWD-positive deer began to be detected southeast of the established cluster. Since then, the disease has spread along the Virginia-West Virginia state line and also further east across Frederick County. In 2018 CWD was detected for the first time in Culpeper County. In 2009, the Department established a Containment Area (CA) to help delineate mandatory sampling requirements, liberalized bag limits and seasons, and carcass movement restrictions. The CA was expanded in 2015 to include all of Frederick, Clarke, Shenandoah, and Warren counties. In 2019, after the detection of CWD in Culpeper County and the subsequent need to create a second CWD response/management area in Virginia, the Department elected to utilize the term CWD Disease Management Area (DMA) instead of CWD Containment Area to delineate affected counties. 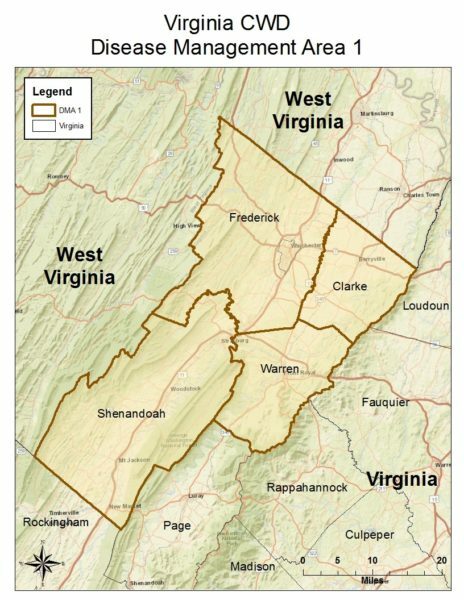 DMA1 contains the same counties as the current Containment Area (Clarke, Frederick, Shenandoah, and Warren Counties). The borders of CWD DMA2 have not yet been established but will be released to the public well in advance of the 2019 fall hunting season.